How successful is IVF treatment in women with endometriosis? During the early days of IVF treatment, patients were placed into two groups; one which dealt with tubal factors and which was considered to have a better outcome and a second one, which encompassed all other causes of infertility. Patients with endometriosis were placed into this second group, with a less favorable prognosis. Women with endometriosis do not respond as well to ovarian stimulation, producing less oocytes, less embryos and have a smaller percentage of implantation. Most doctors report a lower number of pregnancies for them. This bias regarding the outcome of IVF treatment in women with endometriosis, was reinforced in 2002, by a study carried out by Barnhart et al. This meta-analysis of 22 published studies showed that those women with slight endometriosis, had a similar percentage of pregnancies to those with tubal problems. However, those with severe stage 3-4 endometriosis, had a 50% lower pregnancy rate. The major flaw of this study though is, that it was based on studies performed from 1980-1999, days in which drug protocols, as well as the procedures used in the laboratory, were very different and much less successful. Therefore the question remains. Is it true that women with endometriosis have a lower pregnancy rate during IVF treatment? The answer is definitely NO. By studying National IVF registries that follow all IVF cycles on a yearly basis, the results clearly show that patients with endometriosis have an exceptional number of births, even higher than those with tubal factors. Τhe CDC in the USA, the FIVNAT in France and the HFEA in the UK are responsible for the collection of IVF cycles in their jurisdiction and the maintenance of these huge databases. 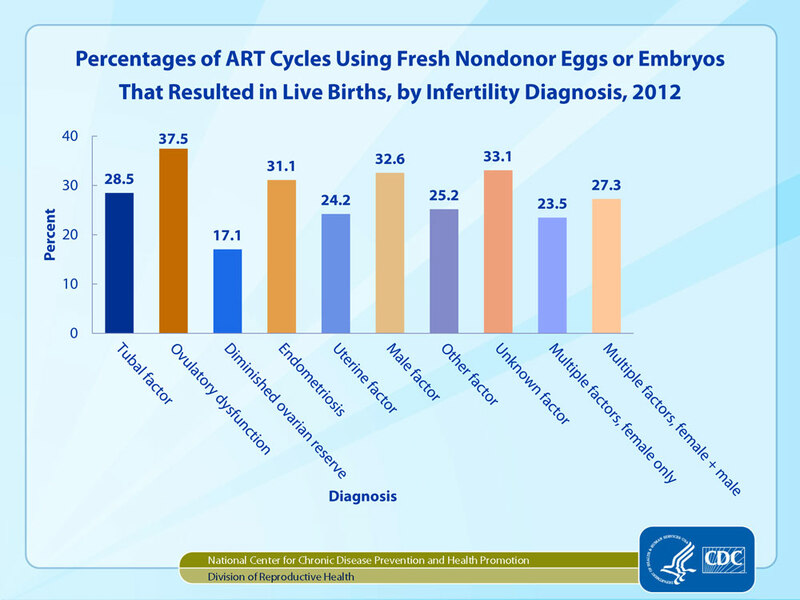 The first graph from the CDC, represents the outcome of 400.000 IVF cycles in the USA in 2012. The number of births from women with endometriosis is 31.1%, which is much higher than those with tubal factors of 28.5 %. 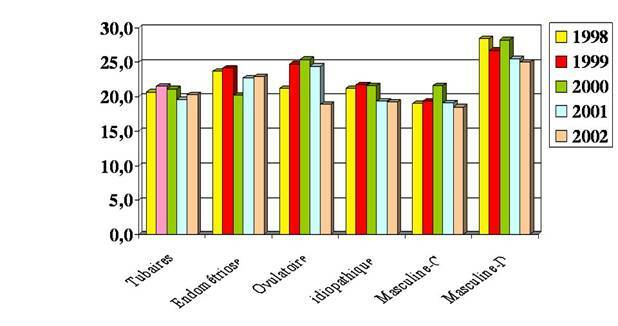 The second graph from France (FIVNAT) shows the results of about 250.000 IVF cycles from 1998-2002. The births by women with endometriosis is 24% compared to 21% from women with tubal factors. The statistical power of these huge numbers can not be matched by any study. Therefore, in reality, women with endometriosis have exceptional results with IVF treatment. They may have less oocytes or embryos, but the percentage of births is outstanding. It is a quantitative matter and not a qualitative one. I intended to put you a very small word just to give many thanks over again just for the extraordinary secrets you’ve provided in this article. This is really incredibly open-handed of you in giving easily what exactly most of us could possibly have supplied for an e book to end up making some cash on their own, principally considering the fact that you could have done it if you ever wanted. The techniques additionally served like the easy way to be sure that most people have similar fervor like my personal own to know the truth somewhat more when it comes to this condition. I’m sure there are millions of more enjoyable moments up front for many who look into your site. I simply wanted to post a small message so as to appreciate you for these amazing tips and hints you are sharing on this website. My considerable internet lookup has finally been honored with incredibly good points to talk about with my guests. I ‘d mention that most of us visitors are truly blessed to dwell in a good place with very many marvellous people with valuable solutions. I feel rather fortunate to have encountered your entire web pages and look forward to so many more awesome minutes reading here. Thank you once again for a lot of things. I intended to put you this tiny observation to be able to say thanks a lot the moment again with your striking ideas you’ve shown on this website. It’s simply shockingly open-handed with you to provide unhampered precisely what many people could have offered as an e-book to get some bucks for themselves, precisely since you could possibly have tried it in the event you wanted. These things in addition served to provide a great way to realize that other people online have a similar dream just as mine to understand significantly more with reference to this matter. I believe there are millions of more pleasant moments in the future for those who look into your blog post. I would like to show my admiration for your generosity in support of all those that need help with this topic. Your real dedication to getting the message up and down had become remarkably helpful and has all the time allowed professionals like me to attain their ambitions. Your entire insightful useful information means so much a person like me and extremely more to my peers. Regards; from everyone of us. I am writing to let you be aware of what a incredible discovery my wife’s girl obtained viewing your blog. She noticed such a lot of issues, which included how it is like to possess an amazing giving mindset to have certain people without hassle comprehend specific impossible subject matter. You undoubtedly surpassed my expected results. Many thanks for displaying those priceless, trustworthy, edifying and even unique tips about this topic to Janet. I and my friends happened to be taking note of the great key points from your web page and so then got a horrible feeling I never thanked the web site owner for those tips. Most of the women are already so warmed to learn all of them and have now actually been taking pleasure in those things. We appreciate you getting quite thoughtful as well as for making a choice on variety of superb things millions of individuals are really eager to learn about. Our sincere apologies for not saying thanks to you earlier.